Maxwell: "Momma says only the diehards are out this morning." Allie: *sigh* "Humans are so difficult to understand sometimes." Maxwell: "Wait. I thought diehards were, like, zombies or something. Those things look like walking stuffed pillows. You sure there's a human under there?" Stay warm, friends. We're in the deep-freeze for a few days! Woot! 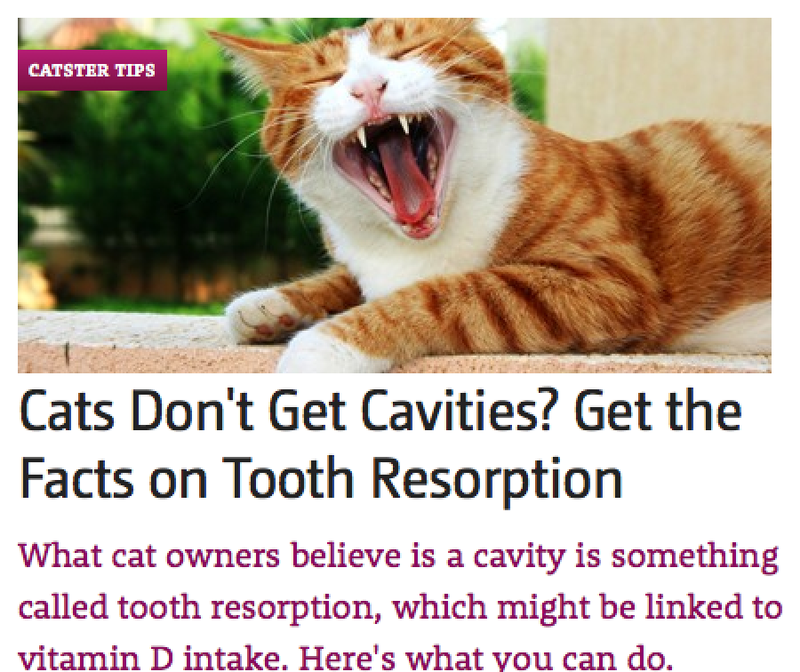 Check out our very first article on Catster.com! "Thanks for clicking on my picture! 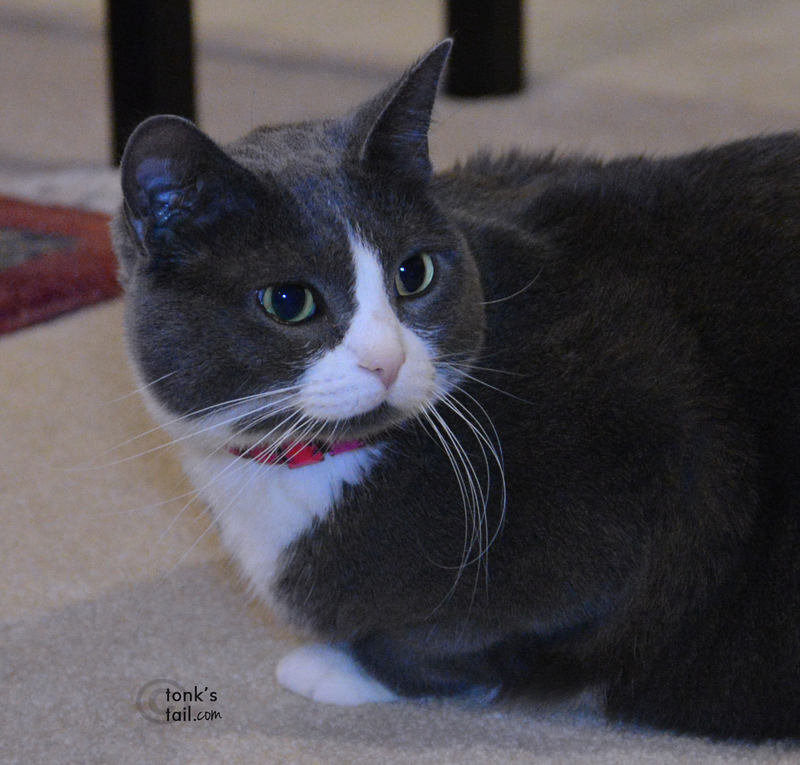 I'm Gray, a classic "blue" shorthaired kitty with gorgeous green eyes." "I was surrendered to Wayside because my previous people had to move somewhere where cats aren't allowed. I was sad to leave them, but I'm so grateful to be here at Wayside, where I have a second chance to find my forever person or people. I can be a little timid in new environments, so I'm hoping that whoever adopts me will be patient and give me plenty of time to adjust to my new surroundings. I'm a sweet, affectionate cat. 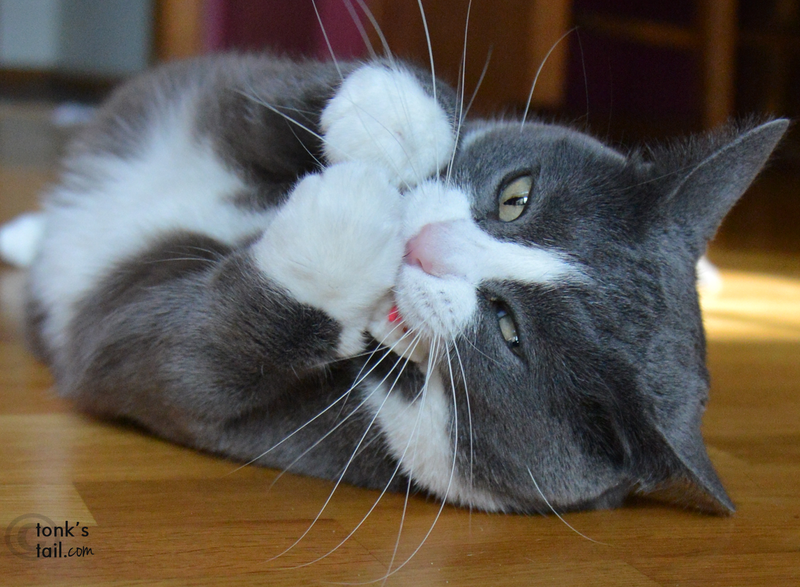 I can be shy at first, but if you speak to me softly and pet me gently, I will warm up quickly. I really love treats. What's my favorite? All of them! I love being petted so much, you could probably pet me all day long. I even enjoy belly rubs, which you can't say about every cat. Let's see, what else? I have lived with other cats before and did OK with them. My Felineality is Secret Admirer, which means I'm a shy guy who loves people very much. Would you like to get to know me better? I'm waiting to meet you at Wayside! 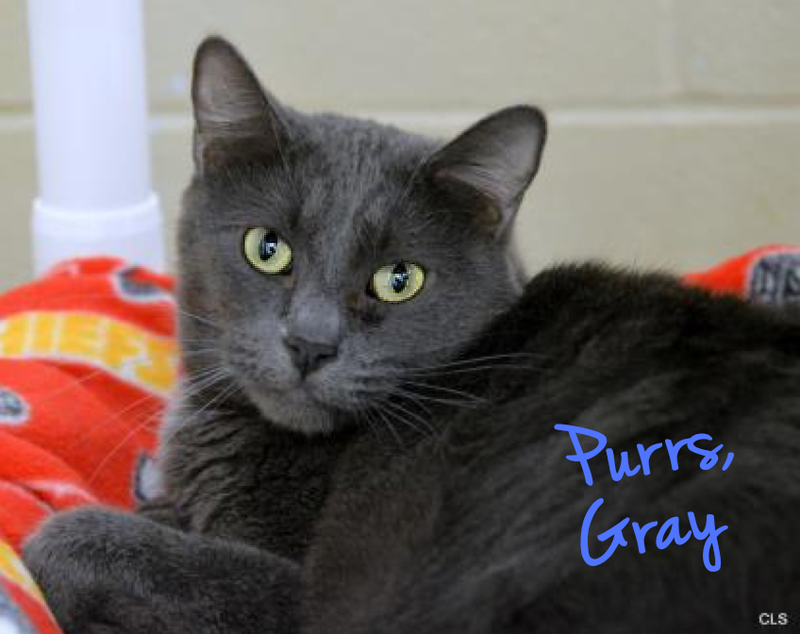 Gray is available at Allie's Alma Mater, Wayside Waifs. Toon Tuesdays feature animal (and sometimes human) humor created by the peeps over at Shoebox Greetings (a tiny little division of Hallmark) - where our mom works, too! 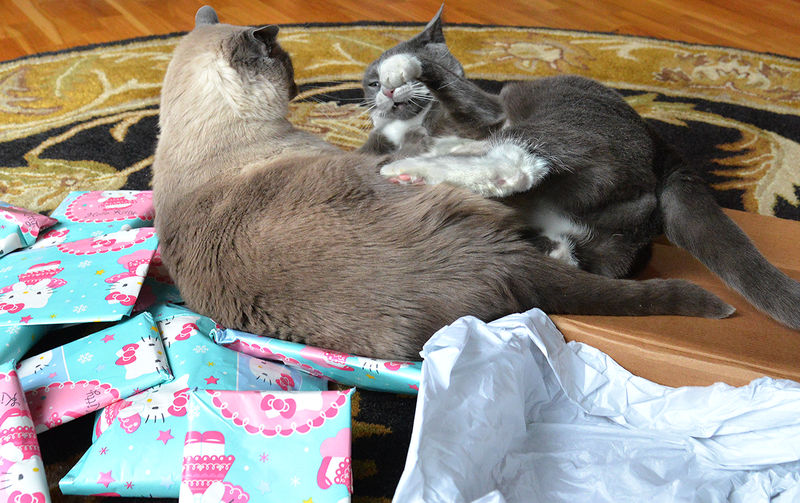 Allie: What do you two think you're doing with our gift?!? We'll spare you the gory details, but after a brief interlude, order was once again restored. Then it was on to the gifting! Kitties! Do you see all the Wand Toy magnificence here?!? Our mom wasn't left out either. She was given such nice gifts by mom Paula! 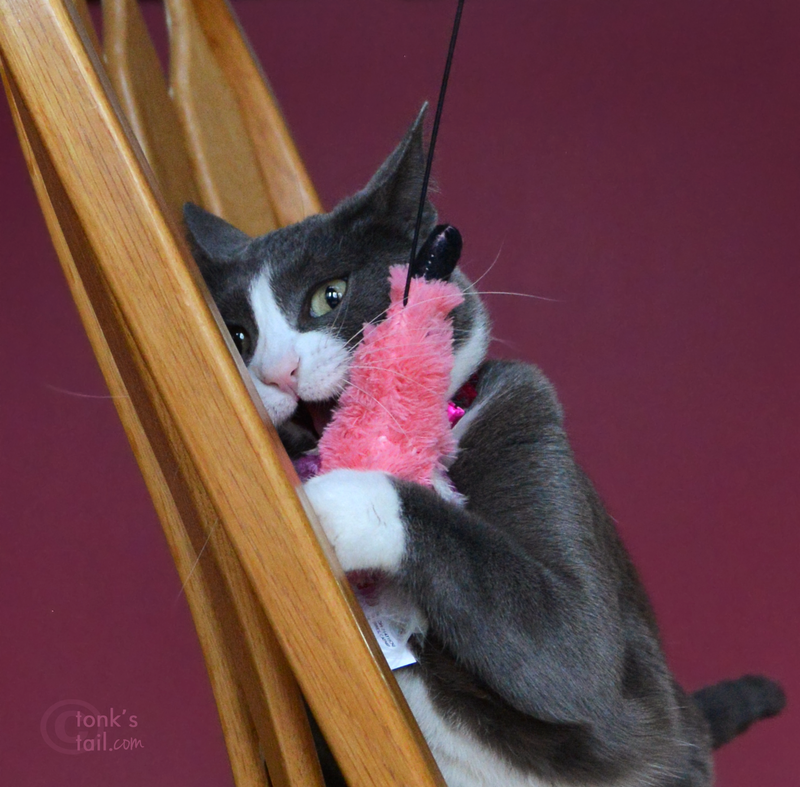 To the surprise of all (said no one, ever) Allie claimed the pink wand toy as hers. ALL hers. 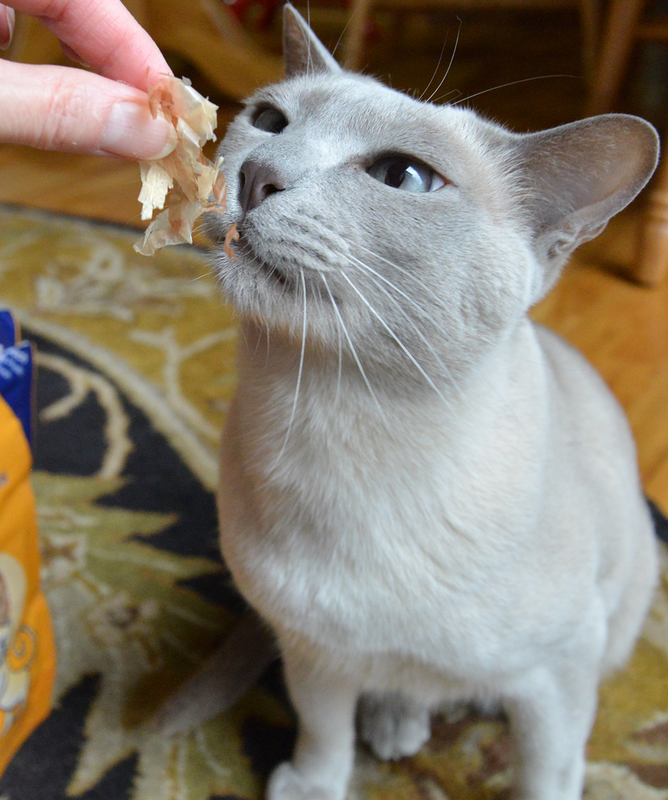 Faraday decided it was safer, after the (ahem) altercation to stick to Bonito flakes for the moment. He adores them. 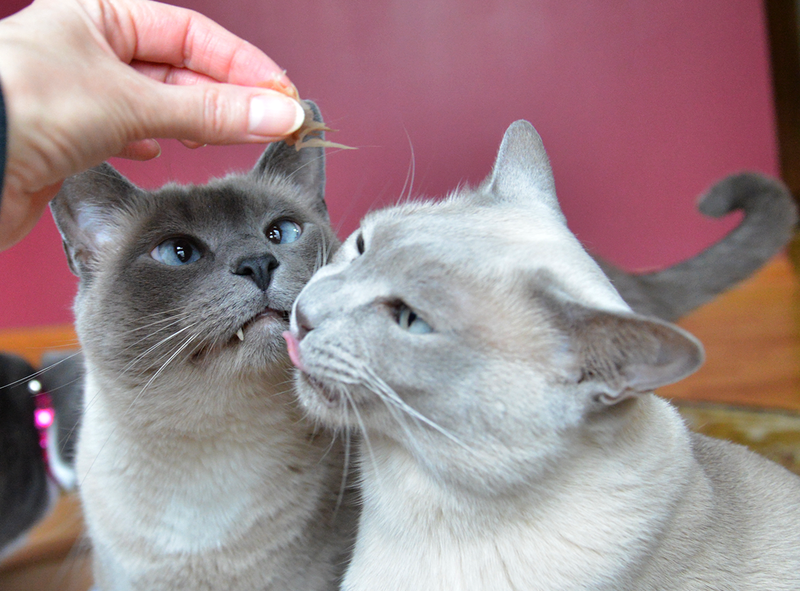 Maxwell decided if Faraday shared a bonito flake or two, that might just go a long way toward forgiveness. But of course, all good things must come to an end. Oh no, not the gifts, dear reader. We're talking about things like Peace & Harmony. Maxwell:Dood, toss it here and I'll forget that earlier incident completely. Word. 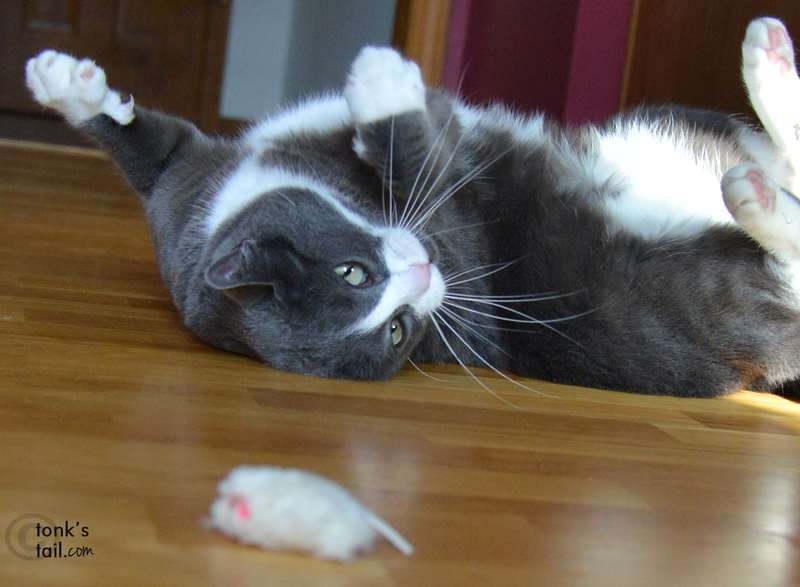 Faraday: What say you, mousie? Nah, didn't think so, either. Allie: Don't even think it, Maxie. Our mom is the cruelest human on the face of the Earth. Do you know how many days it's been since Chanukah? 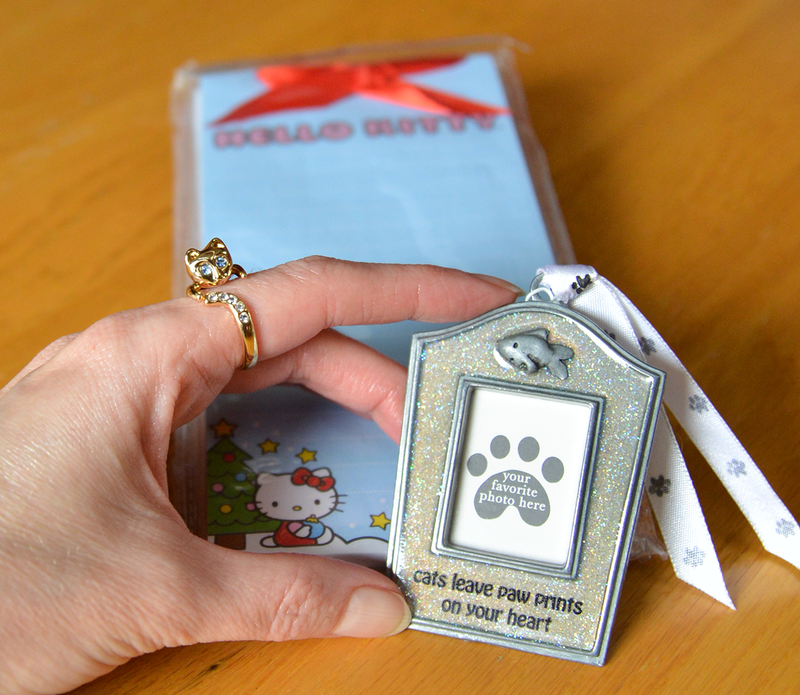 And did you know our Secret Paw gift has been sitting in our fambly room for days and days? Waiting for a "nice, sunny day," she says. Well, we can tell you this: it was worth it! But since our dad is, like, at death's door (not really, just a flu that the totally worthless flu shot didn't prevent) we told her we were okay with just teasing you about it today and giving you the scoop in technicolor detail tomorrow. Basically, she just ran out of time, between snapping photos of our fab selves and making daddy chicken soup. 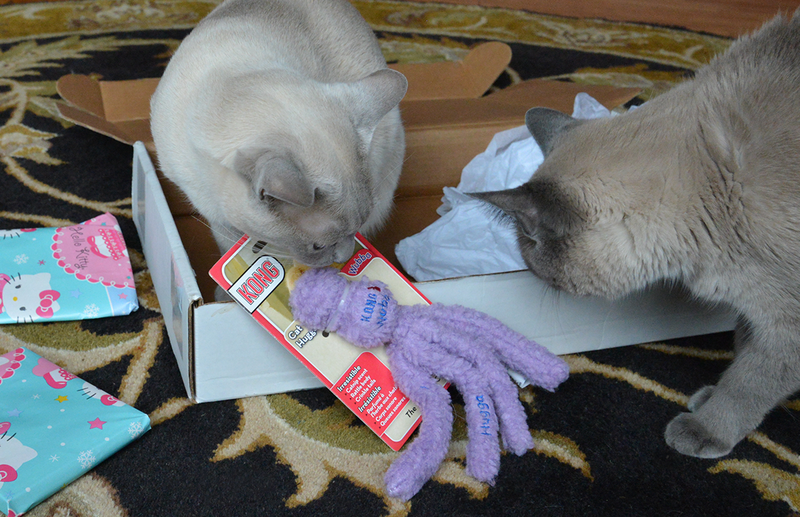 Maxie was with Mommy when she opened the box. He tried the whole "possession is 9/10 of the law" trick. But I wouldn't let him. Guess who our Secret Paw was? 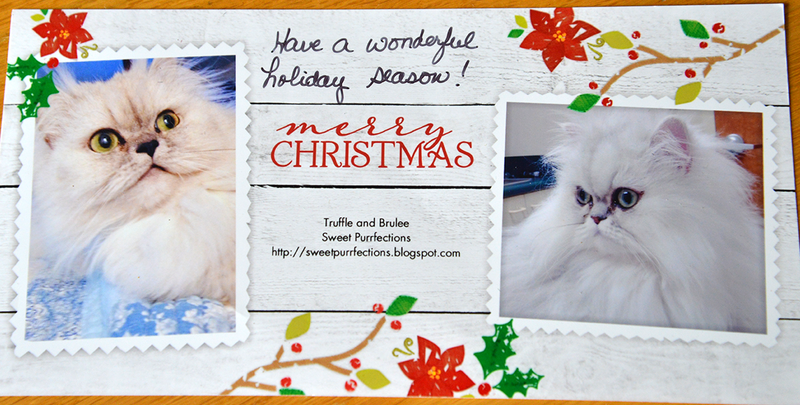 Truffles, Brulee & Mom Paula from Sweet Purrfections! Stay tuned tomorrow for the Tell All! "You know how Jazz can make you feel excited and mellow all at the same time? I can't be sure if that is where my name came from, but I sort of like to think my personality has a bit of that mix too." "Being a young lady, there is still that playful and curious nature in me that pops out quite often - that is the exciting part. 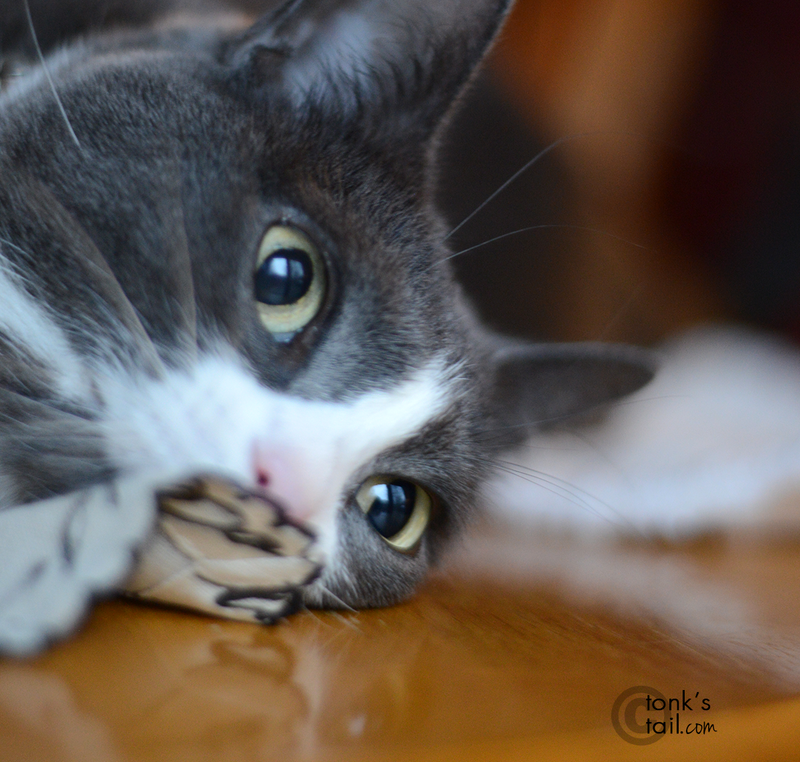 Those cat toys with a human on the other end are pretty irresistible, and those catnip mice, oh, my, what could I say to describe how much they can get me going? Then, the mellow side slides in, with all the quiet, lovey and smooth pets and purrs. I have relaxation down pat and ready to practice in my very own new family. It would be so wonderful if you came to see what kind of harmony we can create together. If we come up with melodies that please us both, we can easily arrange to play our own private home club every day. Let's get in tune soon, okay? 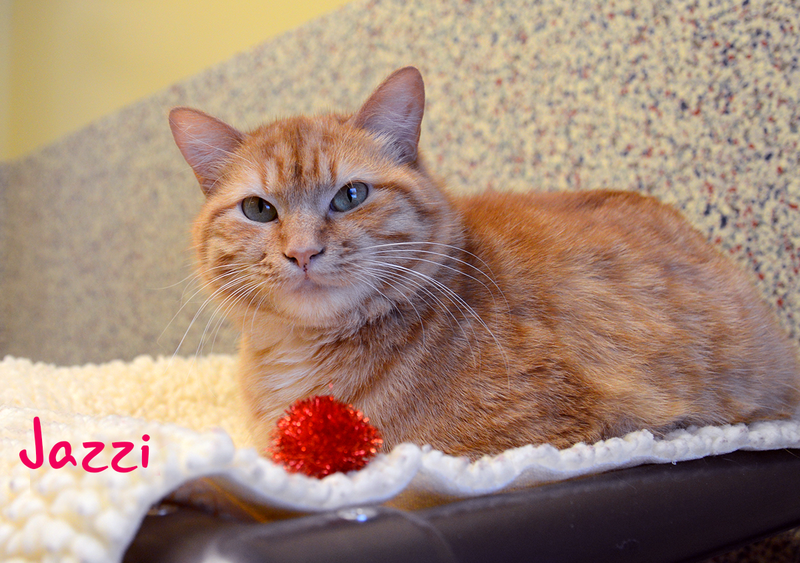 Jazzi is available at the Merriam Campus of Great Plains SPCA today! ...and I'm being Fashionably Late. We hope you all had a wonderful holiday. And enjoyed many delicious noms. Wishing you all a most wonderful holiday! 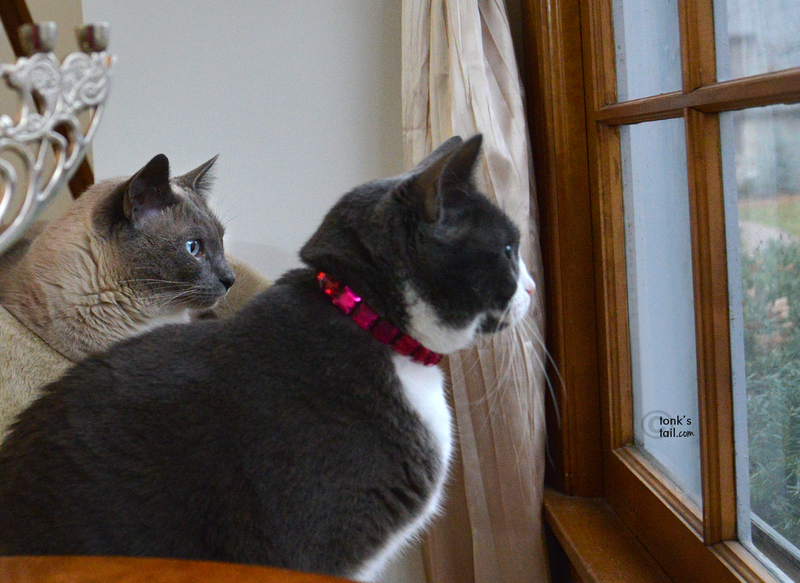 This post is sponsored by Vitakraft and the BlogPaws Professional Pet Blogger Network. I am being compensated for helping spread the word about Purrk! Playfuls, but A Tonk's Tail only shares information we feel is relevant to our readers. Vitakraft is not responsible for the content of this article. So this package arrived yesterday. It had TOYS. I could smell it! SCORE! Look at what we got! 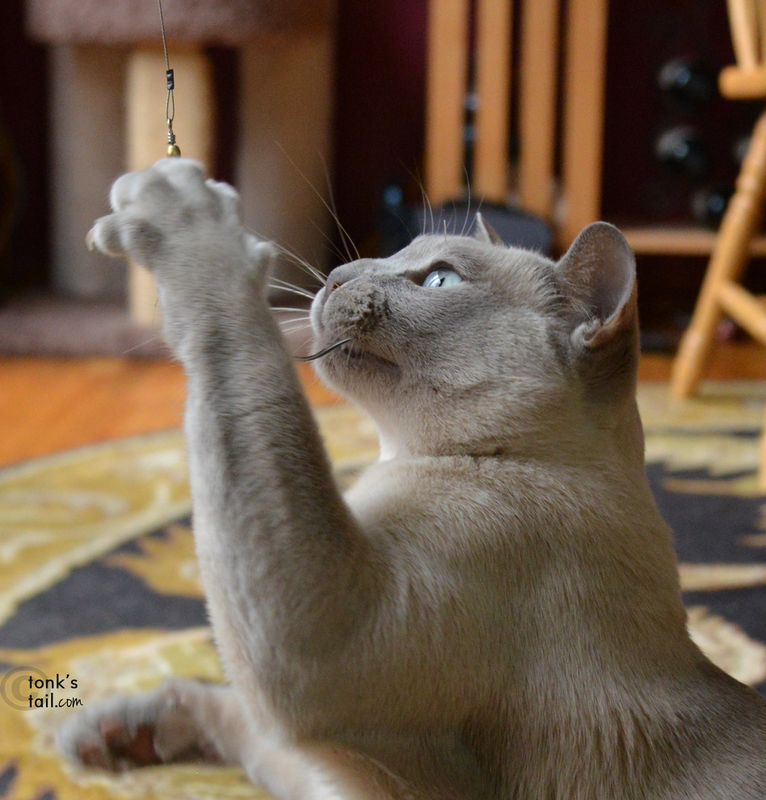 I immediately decided to investigate the Busy Bee Wand Toy (before Maxie grabbed it). Yup. 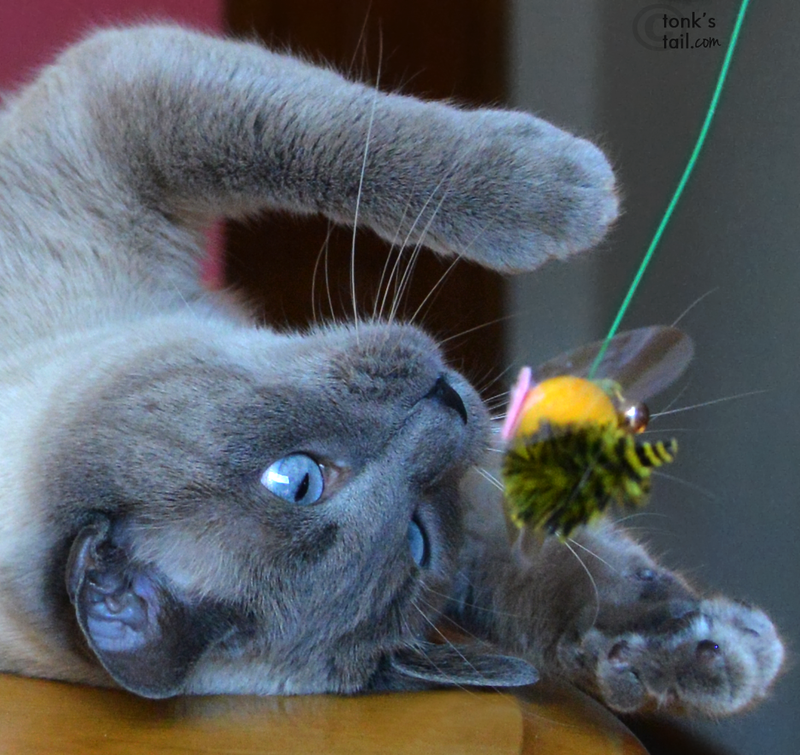 Maxie decided the Busy Bee was his. Hrmpf. "I love how it glitters. 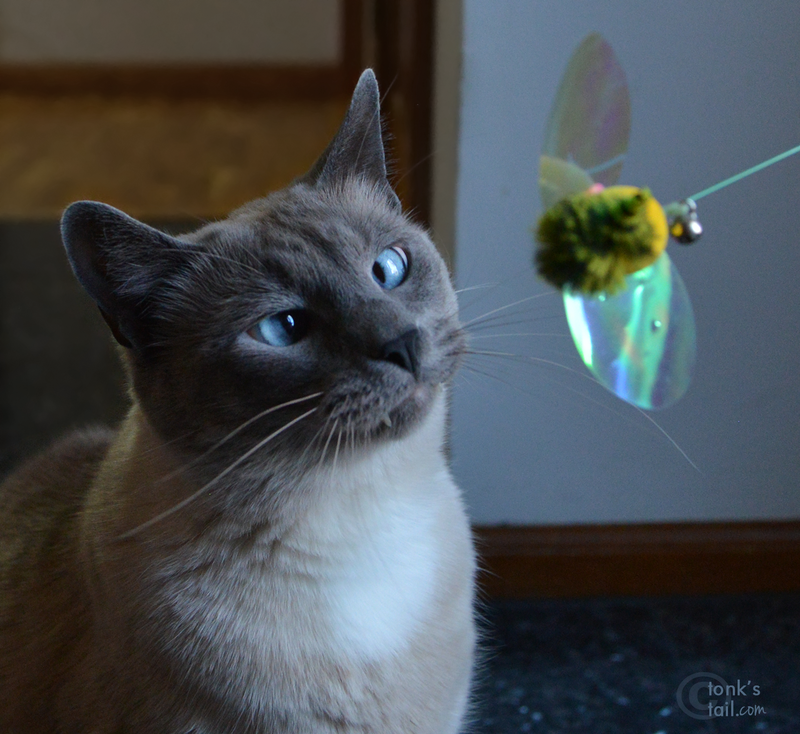 You're mine, Mister Bee. All MINE." What makes us love this Busy Bee so much, aside from the fact it wiggles and jumps? It's infused with Silvervine (and it came with an extra packet of it, too!). 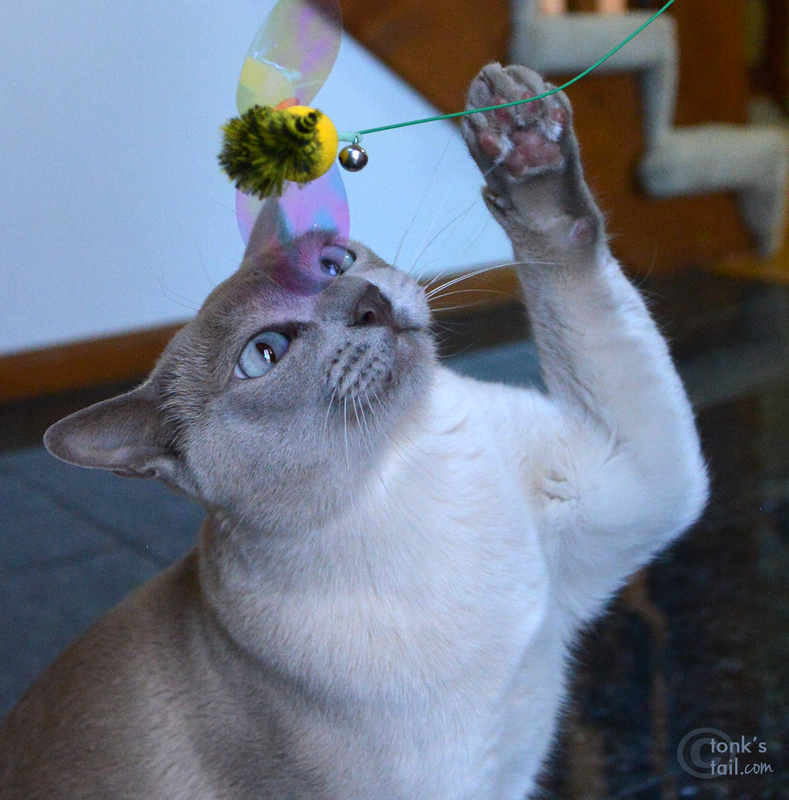 Silvervine has been around in Asia and the Pacific Rim for years, but until recently your humans had to know someone overseas if you were going to get your paws on any! 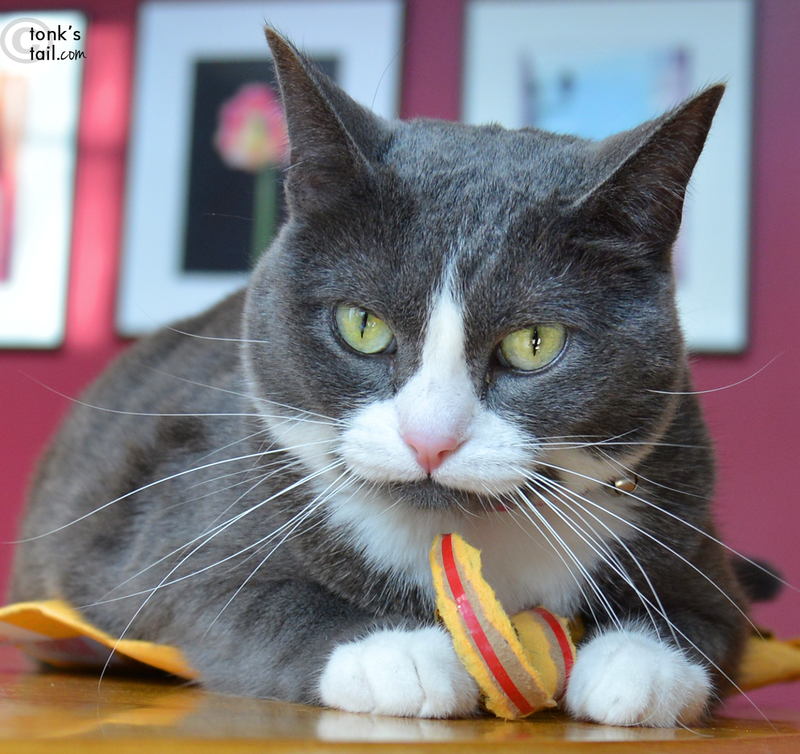 According to a recent study by the University of Illinois, Silvervine yields a stronger response and increased playtime in cats, as compared to catnip. 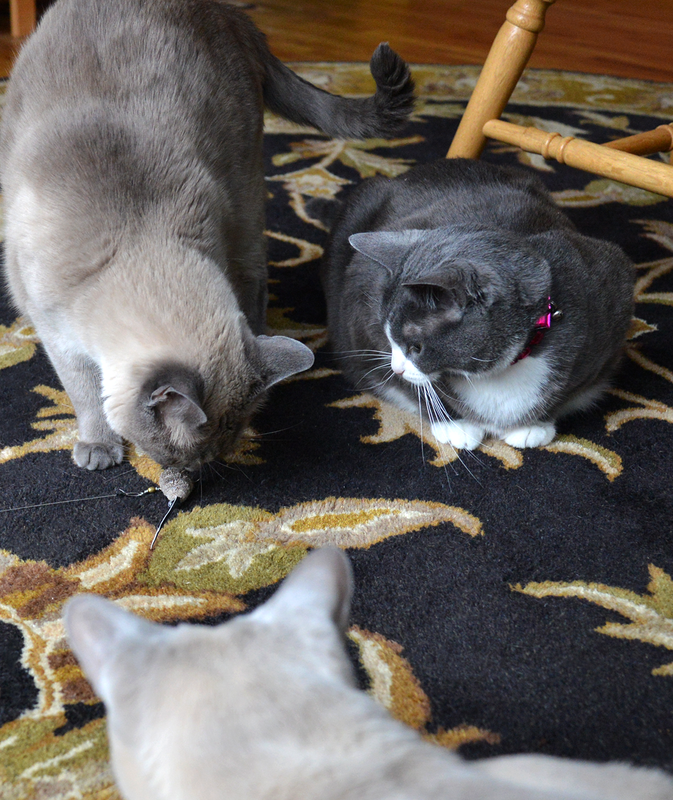 And the study showed 3 out of 4 cats preferred Silvervine over catnip and engaged with it 2.5 times longer. Allie agrees. The package of silvervine refills came with a complimentary white mouse. "Hmmm, what's this I smell?" 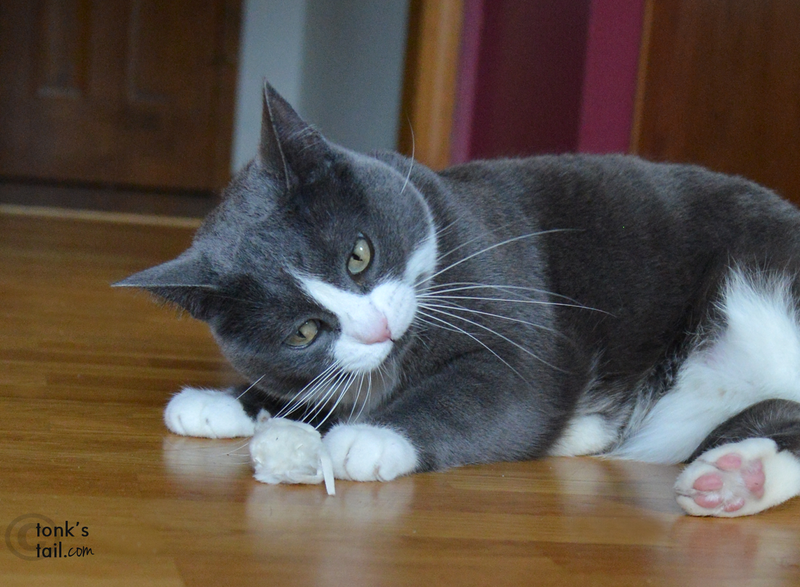 "Mousie, I think this is the start of a lovely relationship." She found the Ashland University study results fascinating. 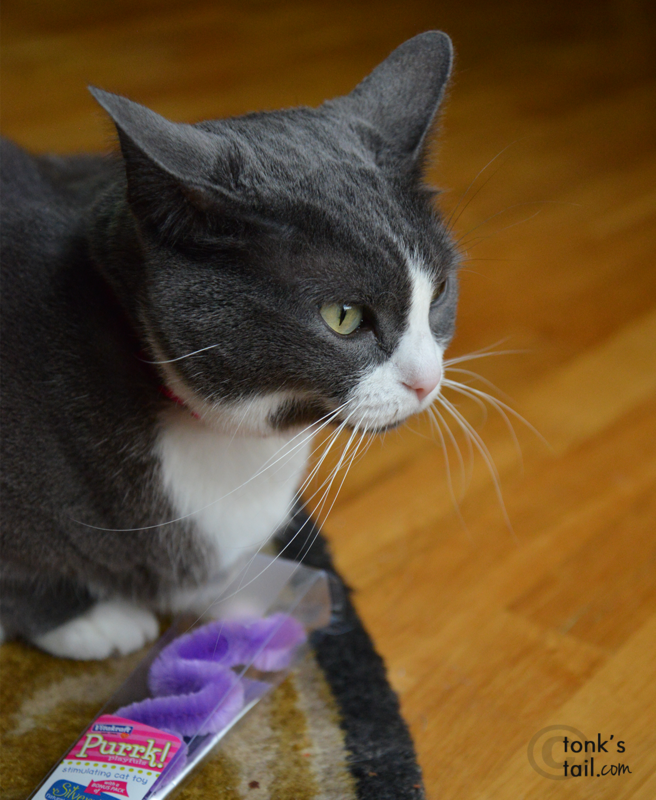 It used a control, rabbit fur, and lavender in addition to catnip in its study. 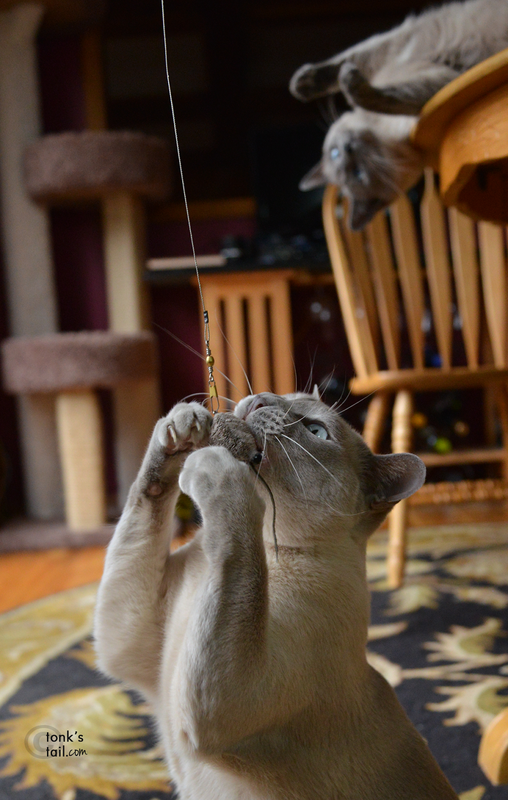 The investigation found that silvervine caused cats to both be more playful and to sit longer. Playful. You know. Like this and stuff. What did the researcher mean by sitting? "There was an increased frequency of sitting and playing when silver vine was used. The increase in sitting was most likely because the cats would sit and watch the other cats that were interacting with the cloth , waiting for their turn or just observing what was happening. Cats are naturally curious animals and so the sitting was most likely them satisfying their curiosity as to what was happening." But back to the important stuff. The TOYS. 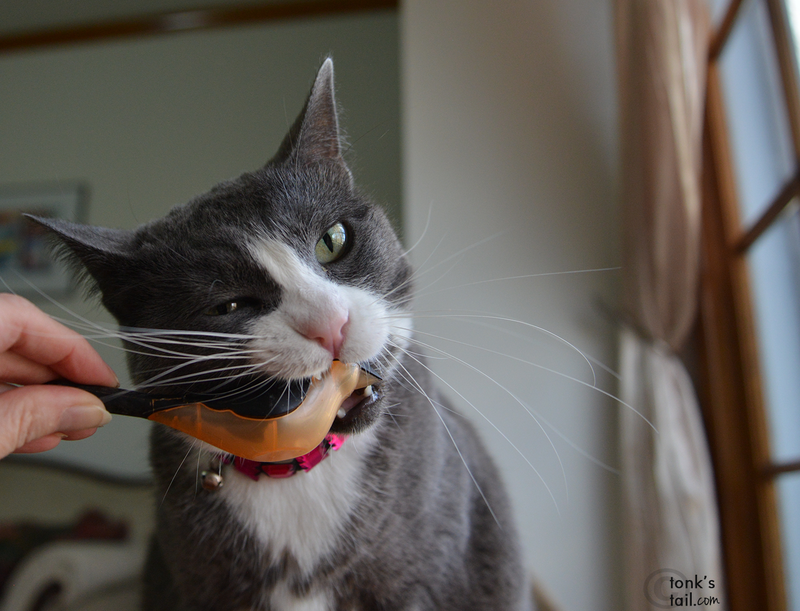 The third toy we received was the plastic Perky Bird and it had a jingly ball inside. Although it smelled really cool, when presented with it, Allie tried to gnaw on it. 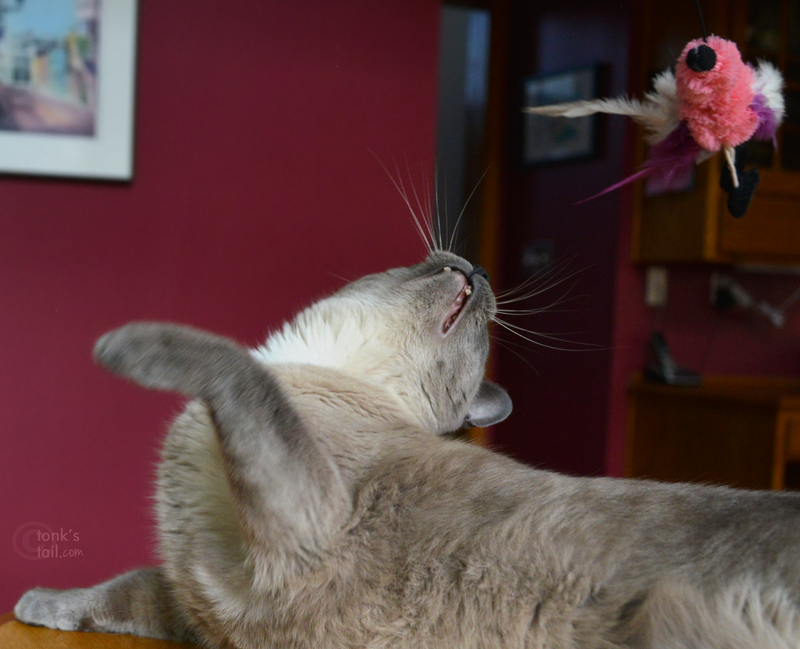 But hey, that doesn't mean somekitty out there wouldn't really enjoy knocking this birdie around. As you know, cats have very specific tastes. 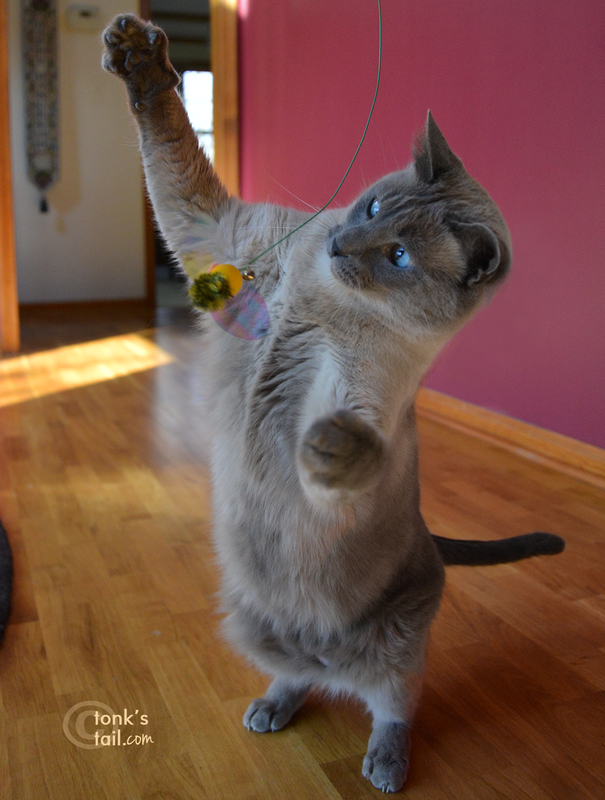 Ours just happen to run more toward the squishy toys, and the ones that fly. So all of this is nice and all, but what's the big headline here? 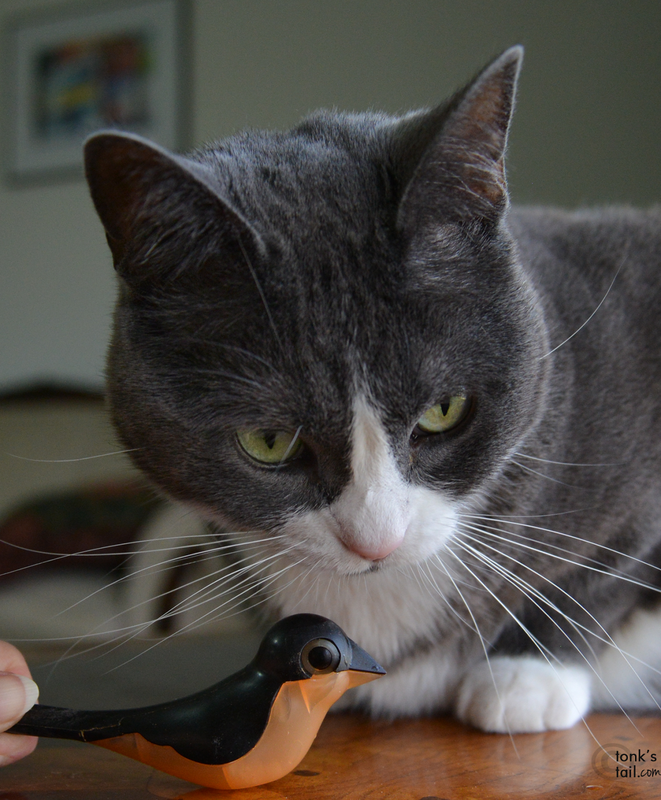 Well, in 2014, online specialty pet stores in the U.S. did began to offer Silvervine toys for sale. BUT. You couldn't find them on the shelves locally anywhere. Thanks to Vitakraft, now you can. Maxie's pretty jazzed about that, too. As you can tell. In our town they're on the shelves at Petco and PetSmart (woot!). To find the store nearest you that carries Vitakraft toys, click on the store locator button and input your zip code at this link here. Or you can buy online, too. 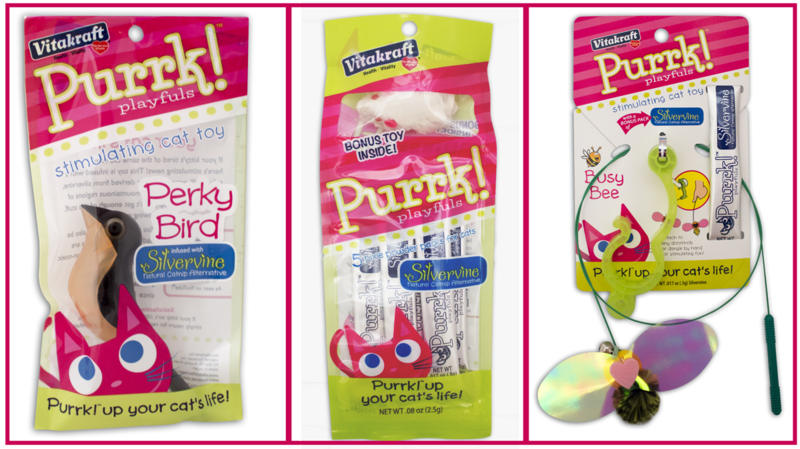 Vitakraft sent us two complete sets of their Purrk! 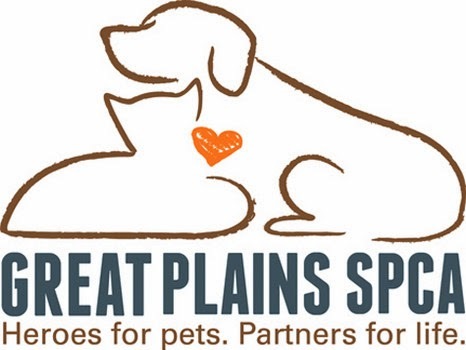 Playfuls toys, and so it was decided the second set would go to Great Plains SPCA to help enrich the cats living there. "NO, Mother. 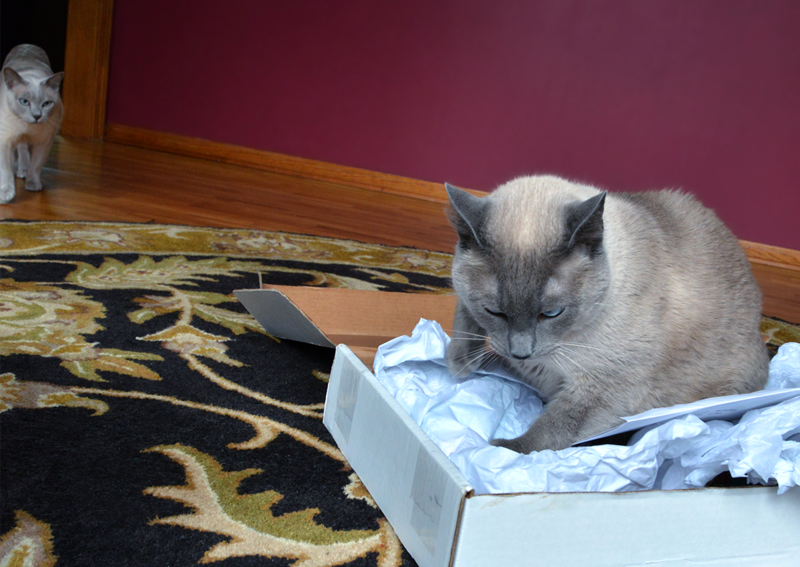 This package is mine. All MINE." Anyone wanna try to get that away from her? Anyone? Bueller? Thankfully, no one has to risk life and limb wrestling that second set of toys away from Little Miss Selfish. You can enter to win one of your very own! Giveaway ends Tuesday, December 30 at 11:59 P.M. Pacific Time. Open only to residents of the lower 48 U.S. states. Must be 18+ to enter. Winners can only win once across all blogs participating. No purchase necessary. Void where prohibited. Winner has 48 hours to respond before a new winner is selected. What do you think? Would these toys help with a good New Year's Resolution? 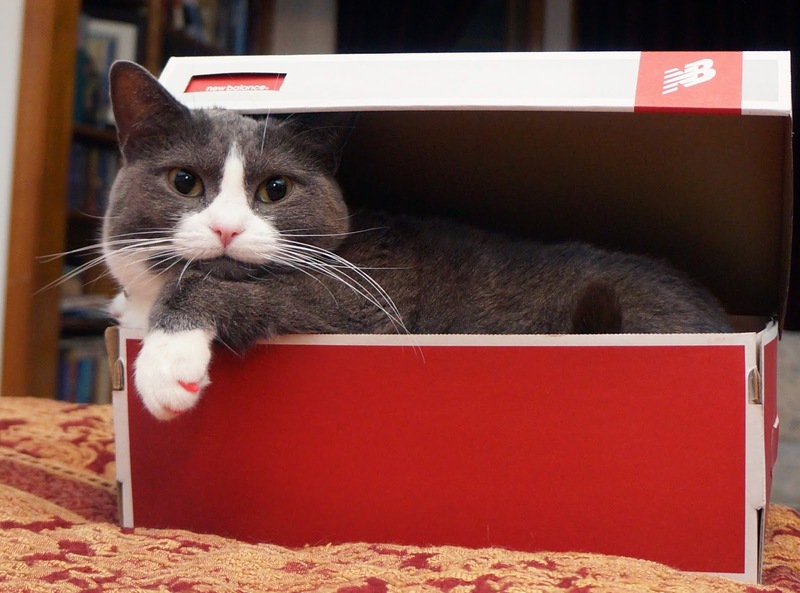 • More active cats = healthier weight! 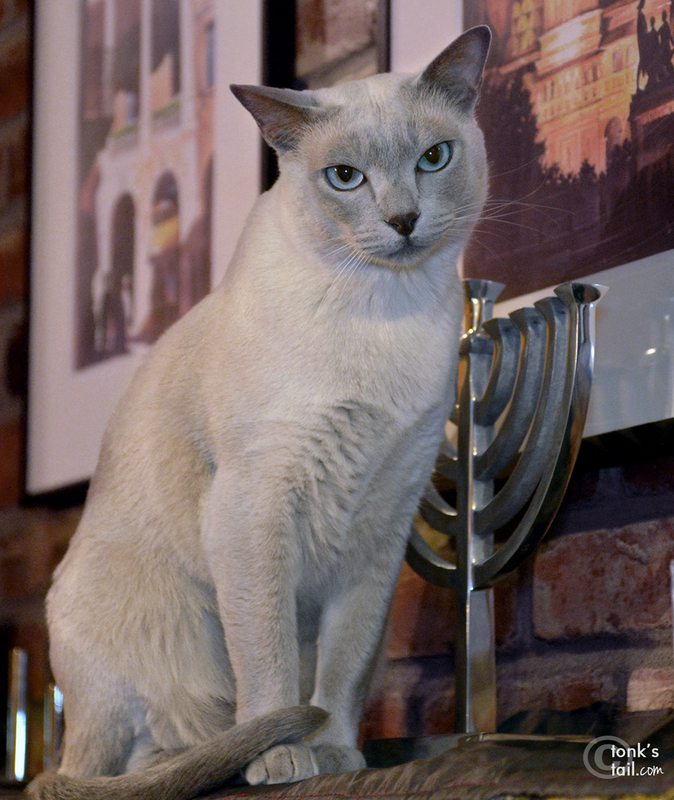 So Saturday night we lit the 5th candle in the Hannukah menorah, and all the cats were present, and we opened gifts and had a wonderful time. 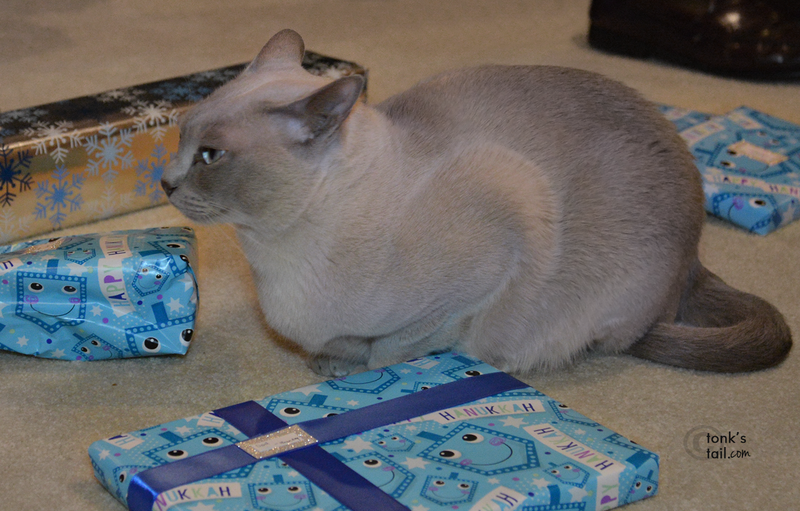 Maxwell hung out on the discarded gift wrap, until he decided to go exploring amongst the gifts. Mind you, there were five adults in the room, carefully watching him. 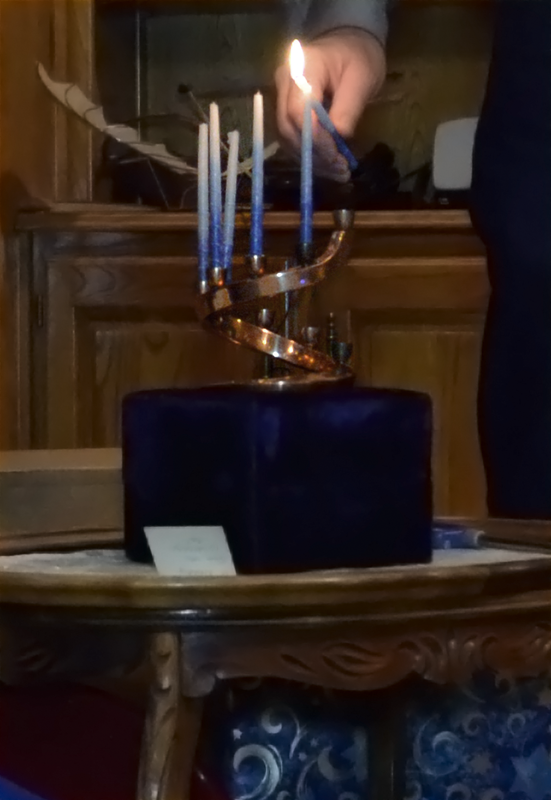 But still, before any of us could react, he jumped onto the table with the menorah ... and his tail brushed across the lit candles. We all leapt up to "put him out" (thankfully he was only singed). But still. open flames and your pet do not mix. Even if you think you're monitoring the situation, all it takes is one brief second, and severe damage could occur. I should have known better. I did know better. I thought I could prevent it. And I couldn't. Protect your pets ~ go electric. Last Day! Enter until 11:59 PM! So, ya think #MyPetLovesLG4KTV ? The warms. I has them.